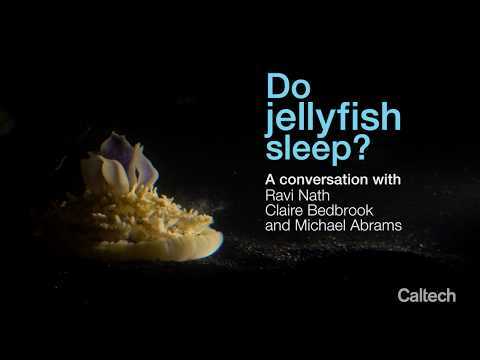 "It may not seem surprising that jellyfish sleep—after all, mammals sleep, and other invertebrates such as worms and fruit flies sleep," says Ravi Nath, the paper's co-first author and a graduate student in the Sternberg laboratory. "But jellyfish are the most evolutionarily ancient animals known to sleep. This finding opens up many more questions: Is sleep the property of neurons? And perhaps a more far-fetched question: Do plants sleep?" Finally, the researchers needed to show that, when deprived of sleep, the jellies would exhibit an increased sleep drive—just as humans do after a sleepless night. To do this, the researchers pulsed water at the animals every 10 seconds for 20 minutes, effectively "poking" them to keep them awake. They then observed that the jellyfish were more likely to fall into the quiescent state during the day, when they would normally be active. "Many animals have the same genes that govern sleep," says Michael Abrams, co-first author and a graduate student in the Goentoro laboratory. "Though it was beyond the scope of our project to measure gene expression in jellyfish, we tested the effects of compounds that in other animals are known to promote sleep, such as melatonin. We found that these compounds did affect jellyfish sleep in the predicted ways, suggesting that their underlying sleep mechanism is similar to those of other organisms—including humans." The Cassiopea jellyfish spends most of its life resting upside down on underwater surfaces.